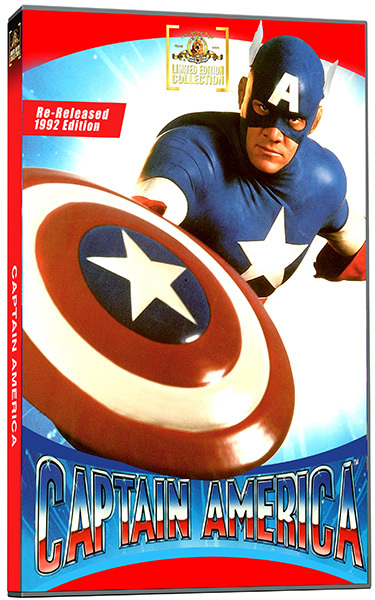 About the DVDTwentieth Century Fox Home Entertainment’s “manufacturing on demand” (“MOD”) program is excited to announce its newest addition, CAPTAIN AMERICA, available on DVD as part of MGM’s Limited Edition Collection. Based on the bestselling Marvel Comics series, CAPTAIN AMERICA stars Matt Salinger (What Dreams May Come ) as a crime-fighting superhero whose strengths and abilities may save the United States from nuclear destruction. During World War II, a brave American soldier (Salinger) volunteers to undergo experiments to become a new super-soldier, codenamed “Captain America.” Infiltrating Germany to sabotage Nazi rockets pointed at the U.S., Captain America faces off with Nazi superhuman warrior Red Skull (Scott Paulin, The Right Stuff ) who defeats the hero, throwing him into suspended animation. Frozen for 50 years, Captain America is found and revived only to find that Red Skull has changed identities and has targeted the President of the United States (Ronny Cox, RoboCop ) for assassination. With America on the verge of utter chaos, it is up to one man to save the day! CAPTAIN AMERICA also features supporting performances from Ned Beatty (Superman ), Darren McGavin (A Christmas Story ), Michael Nouri (Flashdance ) and Melinda Dillon (Close Encounters of the Third Kind ) and Kim Gillingham (“One Big Family”). The DVD will be available for sale on online retailers everywhere. This movie, while not fantastic in acting, still captures Captain America in all of his glory! What I loved about the movie was that the costuming was superb and Cap America fans will love the look and feel of the costume. You get to relive some classic moments between the Red Skull and Captain America as well, and even if you have seen the most recent Captain America movie, the makers of this film still did a great job at getting the Red Skull to have his unique look and feel. Overall, the movie itself is not going to win any Oscars, but for the true Comic Fanatic, you will definitely come to find that this movie is a must have for your collection!